I’ve been having a really good time today playing with a new present I got myself. This new book is by artist Emily Martin aka Black Apple. The book is divided into three parts. 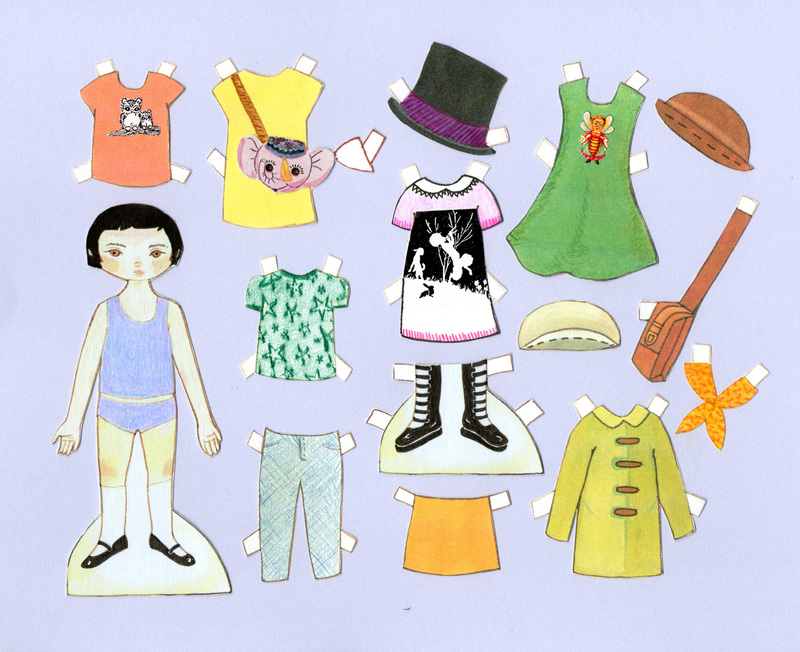 Part One is her original paper dolls and their clothes. Each doll has a personality profile including likes and dislikes, for instance, here’s Alice’s list: Likes: Cats, Books with pictures, Her usual height; Dislikes: Boring Lessons, Disorderly tea parties, Egomaniacal Monarchs. Here’s my favorite personality list item . . . Dislikes: Being Poked (Baby) and yes, before you wonder, Baby is just that; a little rosy-cheeked human baby who looks like the kind of tiny baby doll that sort of slumps warm and cozy in the palm of your hand. Part One also includes a section of background paintings, and a toy theater. I had bunches of fun working on this. I did what the book suggested and used my scanner/copier to make color copies to work on. I used colored pencils, clip art and a sticker to decorate the clothes, you know, the sort of stuff that is always lying around the workroom. Most of the clothes are extremely plain, the idea being that they are sort of blank slates for you to build on. For instance the underwear, the green top, the purple/black/white faun dress, and the yellow neck scarf were originally totally white. The yellow dress was just a plain yellow dress, I added the elephant bag (which is NOT in the book, it’s picture I had on file). I colored a hat band on the top hat and added texture/color to the green dress and blue jeans. I added the owls, the faun panel and the bug lady. I did customize the doll itself, adding rosy color, darkening the brows and eyelashes and giving it brown eyes. I also drew the shoes and then made a pair of wicked cool boots out of a practice doll’s feet (her face didn’t work out — oops). Part Three is projects make with/for the dolls including a storage armoire (to keep the extensive wardrobe of clothing in don’ cha know), play sets, display stands, jointed dolls, flip books, stationary, and a mobile. It also gives directions for playing “Exquisite Creature” which is a more kid-friendly name for “exquisite corpse”; the old funny tri-fold collaborative draw-a-picture game. This is a particularly nice book. I wish there had been a book like this when I was a little kid. 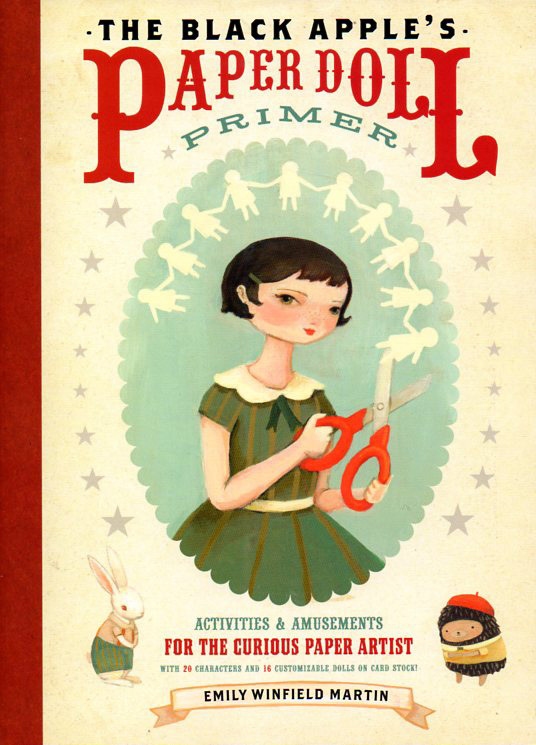 Edith Flack Ackley’s old battered paper doll book borrowed from the library was the best I had back then and this is in color and has better dolls and more projects. Well, better dolls if you’re very into conjoined twins, bears, goth girls and onion-headed creatures . . . which I am. So there.